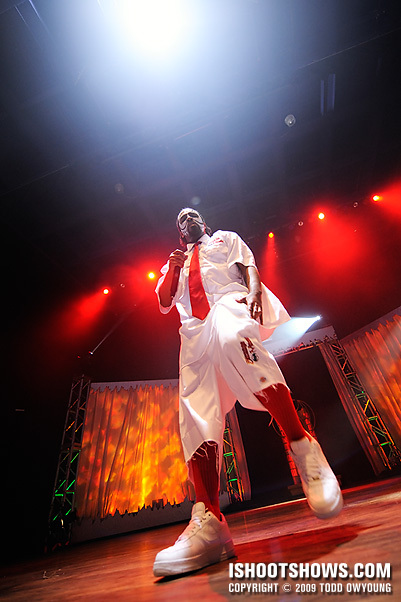 May 13, 2008 – Co-headlining the Strange Music tour with Paul Wall, Kansas City's rap king, Tech N9ne, stormed the stage of the Pageant amid strobes and a flood of red light. 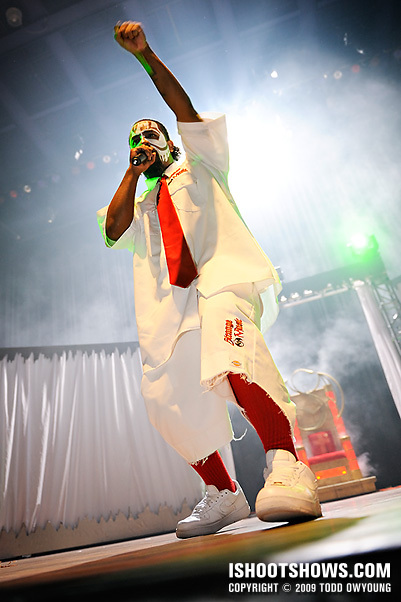 A fixture of the Midwest rap scene, Tech N9ne recently celebrated a career-long milestone of one million record sales, a triumph of hard work that showed in every bit of the veteran performer's energetic show. 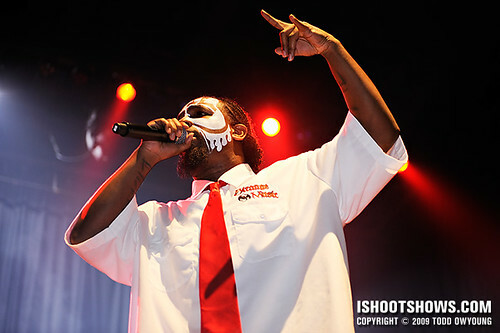 Compared to the performance by Paul Wall that preceded it, the show Tech N9ne was much more visceral, with an intense light show and non-stop action on stage. 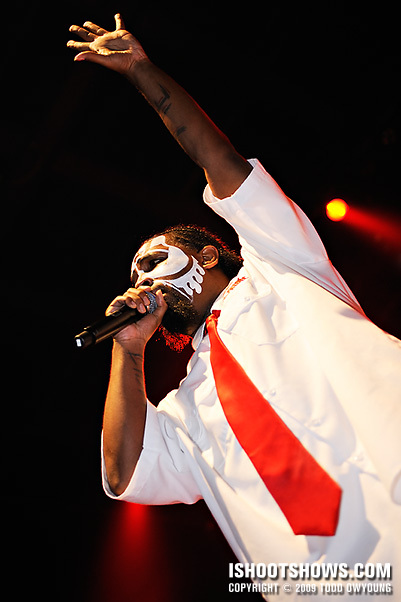 Tech N9ne and his crew came with such unexpected ferocity that most of the shots I have are of the lulls in the set, as evidenced by the number of images above where the rapper has his hand in the air. 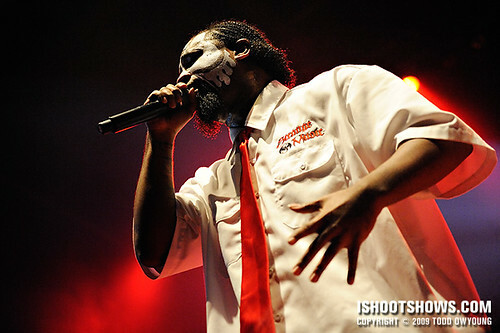 When he wasn't taking a moment's rest, Tech N9ne was waving his free hand, attacking the air in parallel to his rapid-fire flow. The lighting for this set was highly challenging as well. 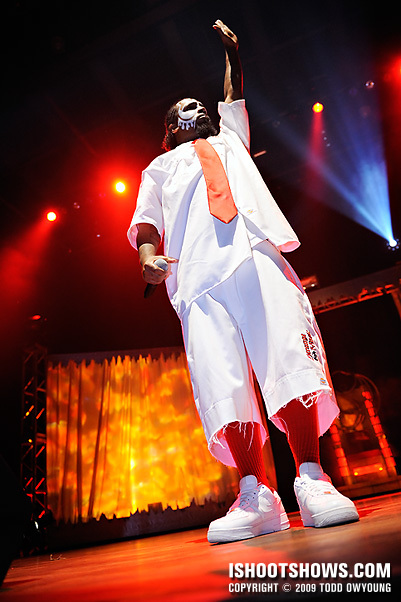 Compared to the sparse effects for the opening acts, Tech N9ne received a much richer treatment, especially from the programmable spots that capped the tower supports for the curtain screens on either side of the stage. For the first few songs, red and orange lighting dominated the stage, interjected by strobe light and blasts of white light from the back. To top off the difficulty factor for this show, the stage was lined with large speaker monitors, which limited shooting angles. But hey, no one gets into concert photography because it's easy, right? Concert photography so often means shooting wide open, maxed out on ISO, letting shutter speeds slide, and generally taking a shot in the dark. What's a few more interesting aspects to provoke creativity? 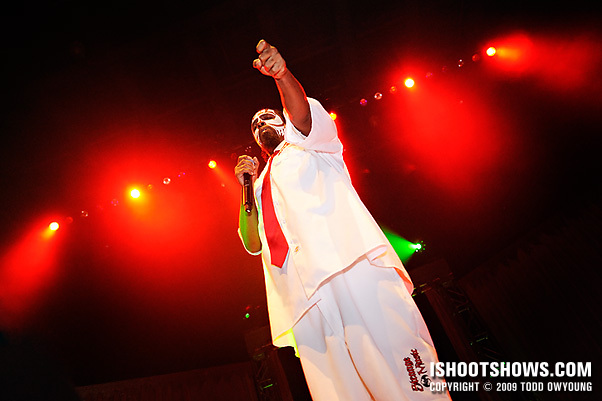 Just as I did for Paul Wall's set, I used flash for a small amount of fill. Nothing fancy with wireless remotes or anything of the like – the SB-800 was simply mounted on-camera, with a little bounce off the flash's built-in card. The main goal of flash for this set was to cut through a bit of the red wash – just enough to give a little more definition while still keeping the ambient light levels at a natural mix. 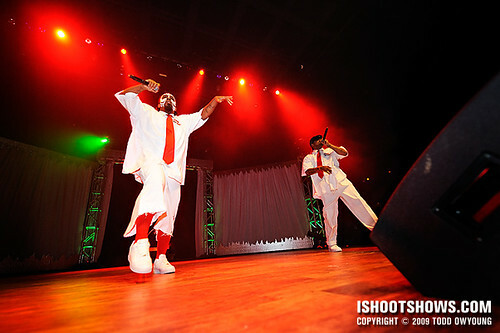 I used the Nikon D3, 24-70mm, and 14-24mm for this show. 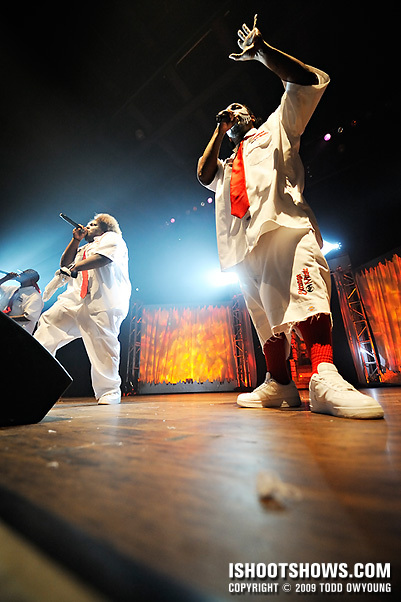 Due to the action on stage, wide angles were in order for much of the shoot. As used from you: Great job Todd! I think you captured again the energy of this gig despite the tricky conditions. You really know ho to fire your flash to get impressive shots! Thanks for the feedback, as always! This was one of the shows where I was just starting to play around with flash for shows. It seems that at hip hop concerts of this size, the rules for flash are much more relaxed. I’m definitely going to look into a tutorial about flash photography, both for just on-camera usage and also wireless, multi-flash setups. Anything else you’d like to see?